The Family Business of the Year Awards (‘FBOTY’) are a real highlight in the family business calendar, organised by Family Business United and now in their sixth year, marking the contribution that family firms make in the UK. In addition to the recognition given to some amazing family firms there was also an appreciation of the people who work for family businesses, especially those starting their careers as apprentices. For many family firms, apprentices are a vital element in creating the next generation of skilled people and future management. This was a strong category with some great apprentices showcasing the diversity of apprenticeships in today’s workplace, including three promising candidates from Bagnalls. The winner was determined by a panel of experienced judges looking for a range of qualities including dedication, an aptitude for learning and pride in working for a family business. 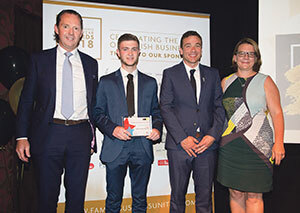 Adam Knowles from the Ellesmere Port branch of Bagnalls was deemed to meet all the criterion and was crowned Family Business Apprentice of the Year. This entry was posted in News and tagged Facilities Management. Bookmark the permalink.